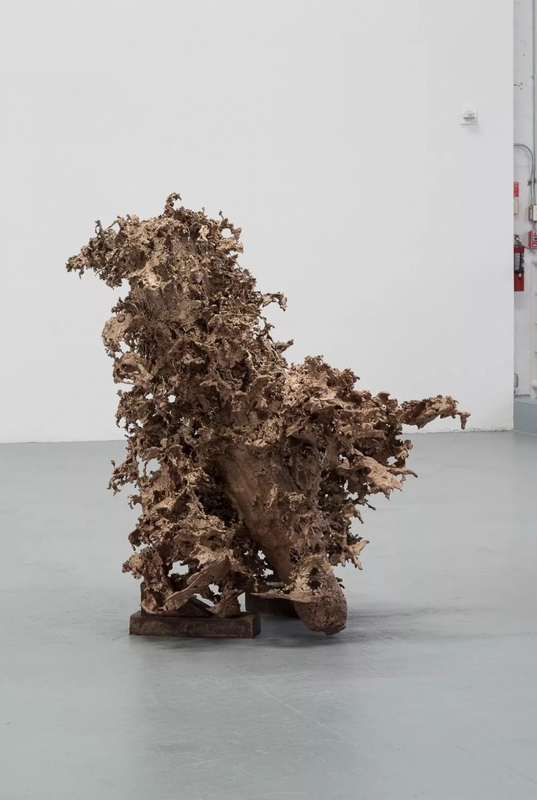 马修·巴尼 Matthew Barney, Water Cast 10, 2015, 铸銅 Cast bronze; 137.2 x 111.8 x 147.3 cm. 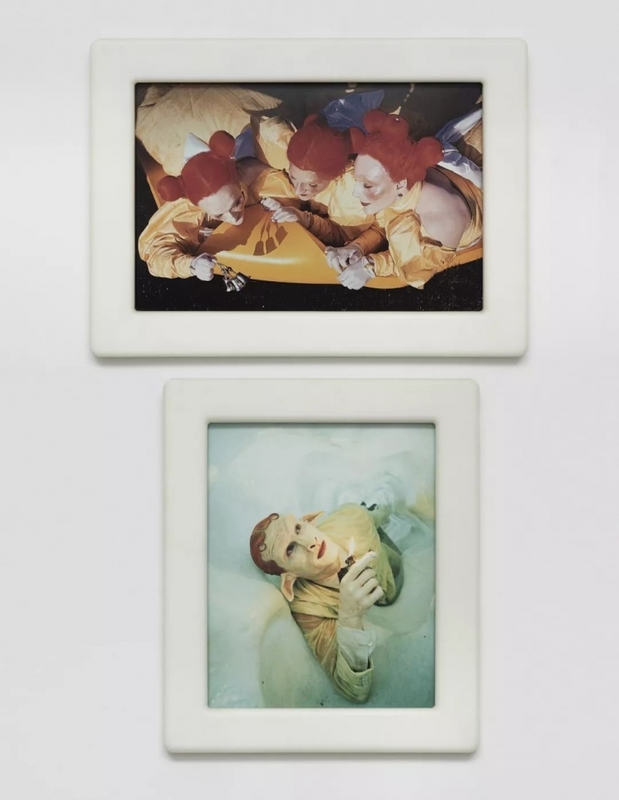 马修·巴尼Matthew Barney, Cremaster 4: Field of the Ascending Faerie, 1994, 两张彩色照片、自润滑塑料框 2 C-prints in self-lubricating plastic frames; 上 Top image: 54 x 74.3 cm; 下 Bottom image: 64.1 x 54.3 cm. 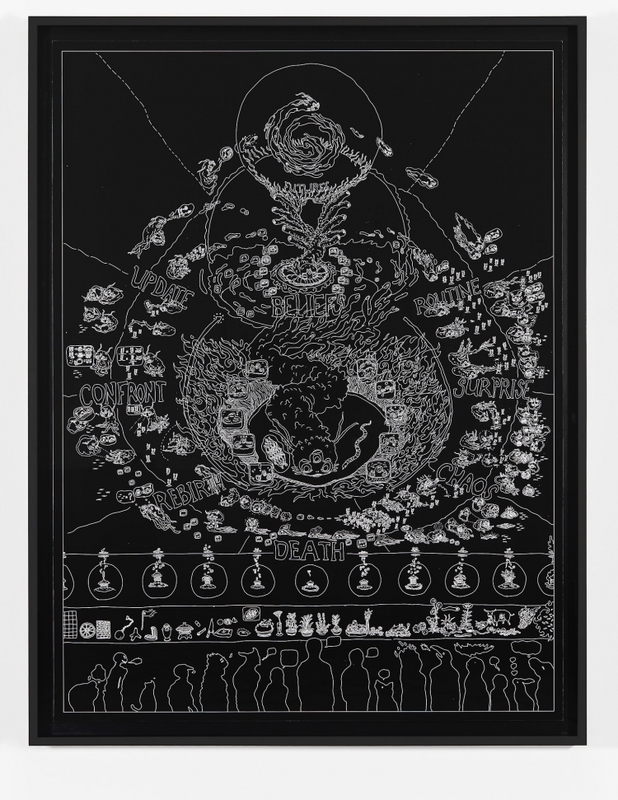 郑曦然 Ian Cheng, BOB Thangka, 2019, 数字喷绘、纸Digital pigment print on paper; 152.4 x 114.3 cm; 含边框 162.6 x 124.5 x 5.7 cm framed. 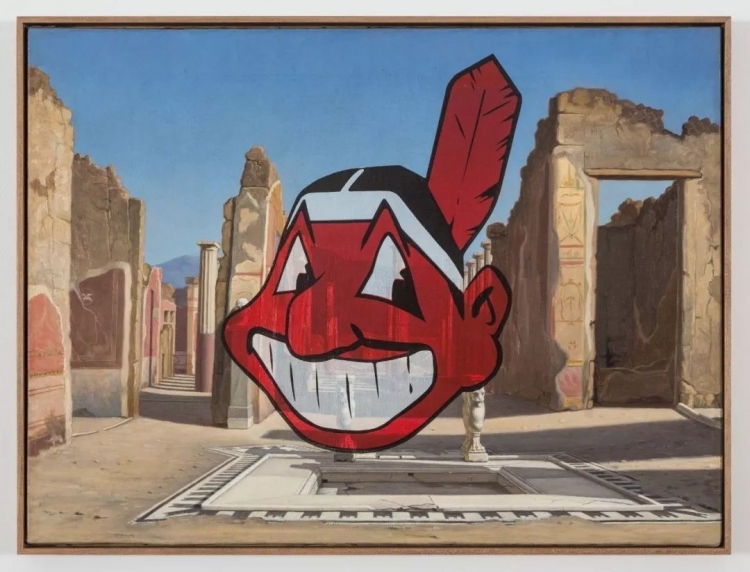 西普里安恩·蓋拉德 Cyprien Gaillard, Untitled, 2016, 丝网印刷、现成油画 Screen print on oil on canvas; 40.5 x 54.5 cm; 含边框 41.9 x 55.2 x 3.2 cm framed. 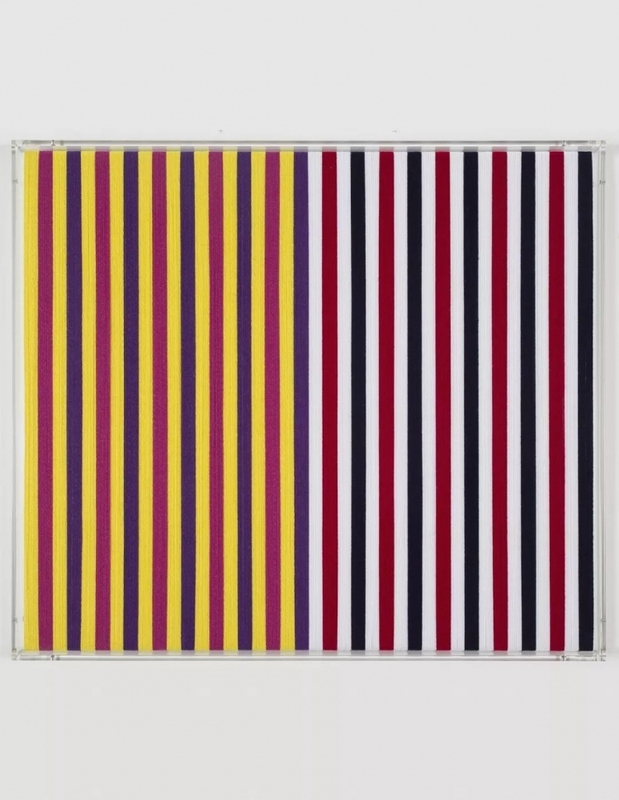 罗斯玛丽·特洛柯尔 Rosemarie Trockel, Midsummer, 2013, 綜合丙烯材料 Mixed acrylic material; 70 x 80 cm; 含边框 71.8 x 82.2 x 6 cm framed. 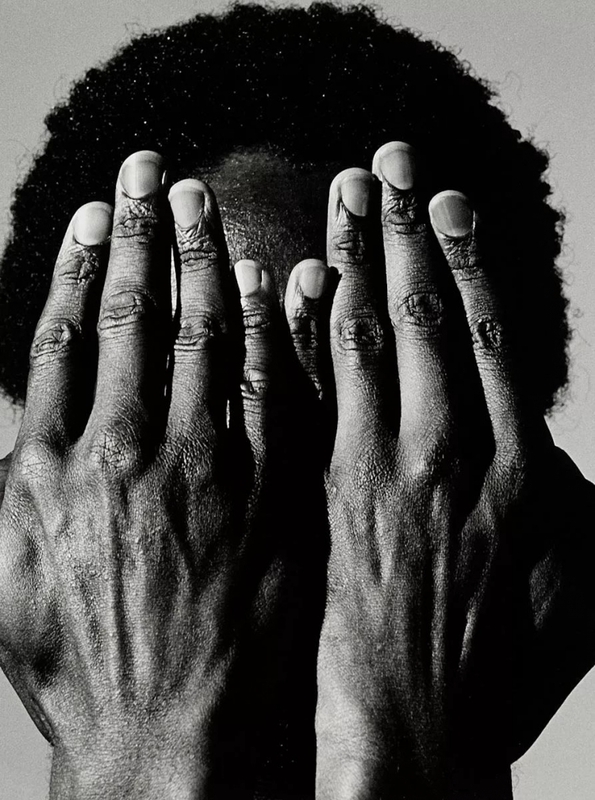 罗伯特·梅普尔索普Robert Mapplethorpe, Alistair Butler （局部 detail), 1980, 银胶照片 Silver gelatin print; 50.8 x 40.6 cm; 含边框 61 x 58.4 x 3.2 cm framed. 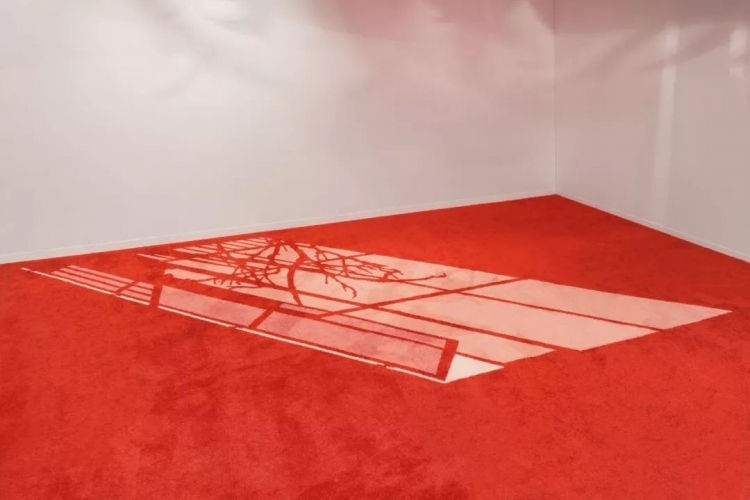 菲利浦·帕雷诺 Philippe Parreno, 6.00 PM, 2000 – 2006, 地毯 Carpet; 尺寸可变 Dimensions variable. 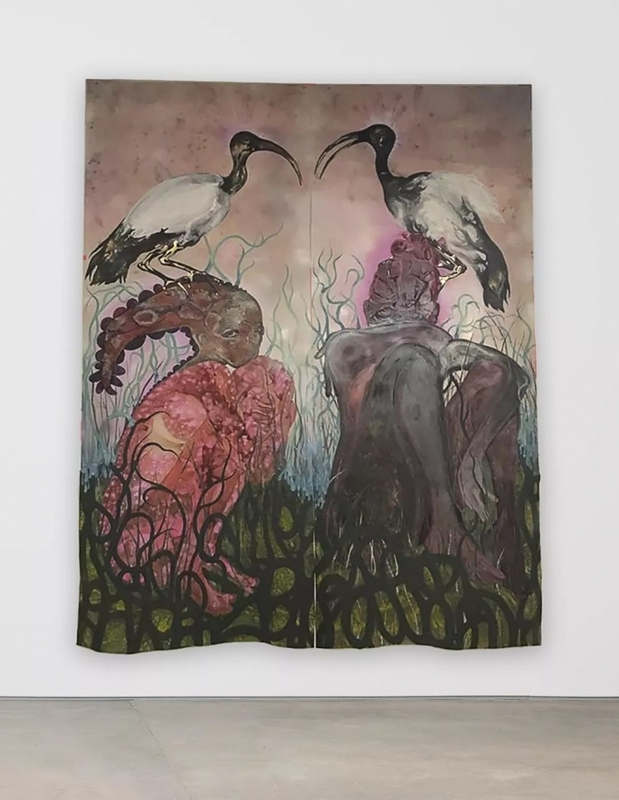 瓦格希·穆图 Wangechi Mutu, Even my old soul has an old soul…, 2019, 墨水、水彩、聚酯薄膜 Ink and watercolor on Mylar; 左 Left panel: 283 x 103.5 cm; 右 Right panel: 283.5 x 103.5 cm framed. 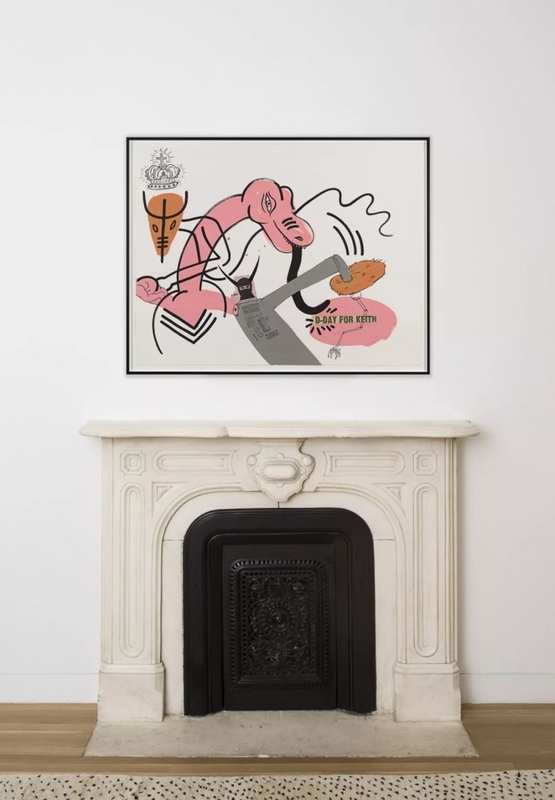 凯斯·哈林 Keith Haring, D-DAY FOR KEITH, 1988, 水粉顏料、墨水、拼貼、纸 Gouache, ink and paper collage on paper; 97.5 x 127.3 cm; 含边框 105.4 x 135.3 x 3.8 cm framed. 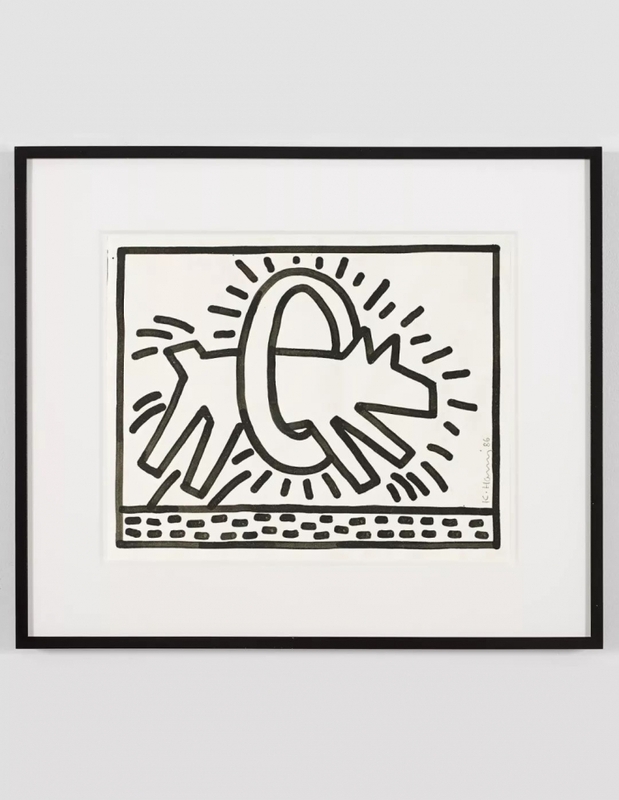 凯斯·哈林 Keith Haring, Untitled, 1986, 日本墨、纸 Sumi ink on paper; 32.4 x 40.3 cm. 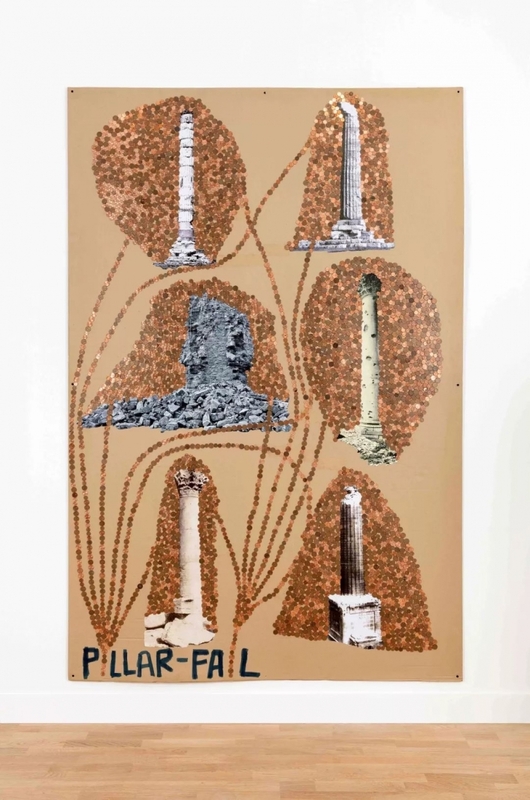 托馬斯·赫賽豪恩 Thomas Hirschhorn, Pillar Fail, 2018, 纸板、拼貼、硬币、胶带、金属配件 Carboard, prints, coins, tape and metal fixtures; 240 x 160 cm. 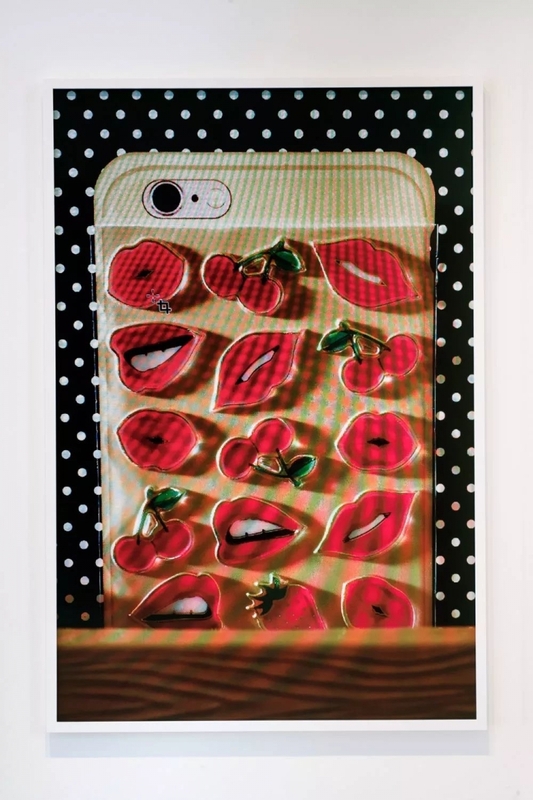 罗伊·埃斯里奇 Roe Ethridge, Lip Stickers, 2018, 染料昇华印刷、鋁板 Dye sublimation print on aluminum; 152.4 x 101.6 cm; 含边框 156 x 105 x 4 cm framed. 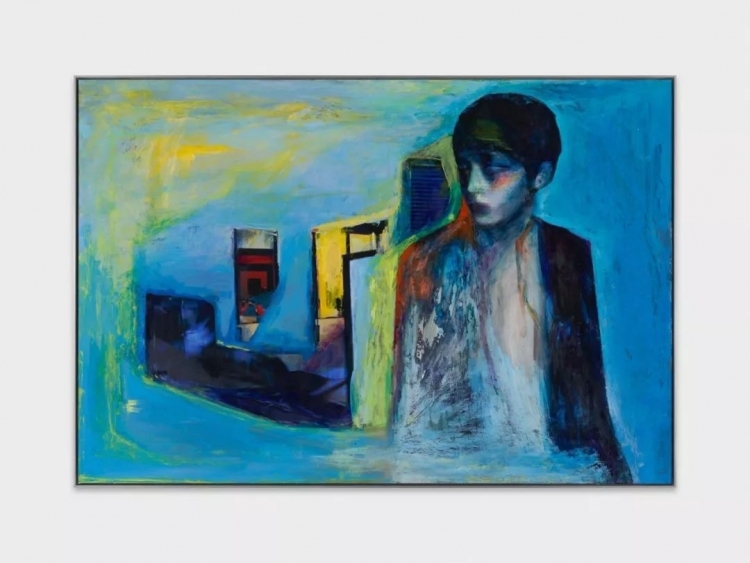 安德罗·维庫亚 Andro Wekua, Untitled (Ledersofa), 2018, 油画顏料、丝网印刷油墨、板 Oil and silkscreen ink on panel; 含邊框 87 x 127 x 2.9 cm framed. 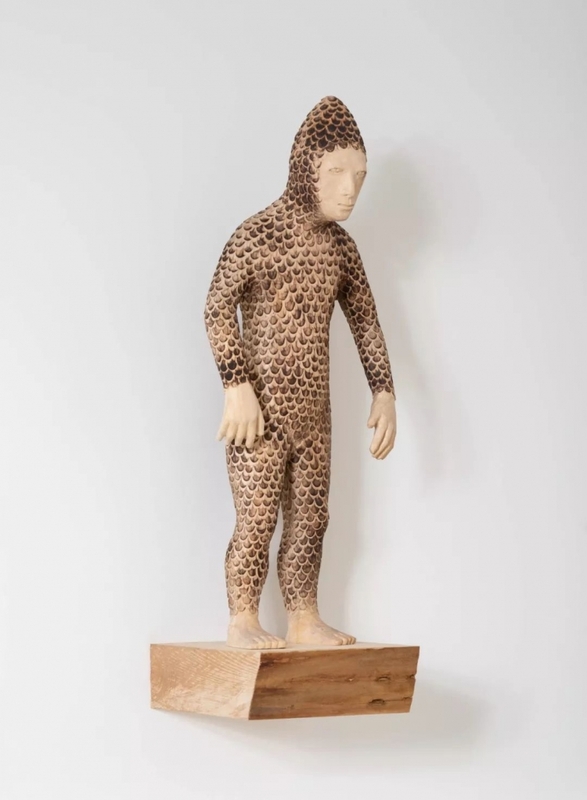 帕洛玛·瓦尔加·薇茲 Paloma Varga Weisz, coneman, burnt, 2018, 椴木 Limewood; 87 x 31 x 30 cm.